I had the pleasure and privilege this weekend of meeting (in person) two Bay area disability bloggers whom I have known (virtually) for a long time: Scott Rains and Wheelchair Dancer. Scott is the wildly prolific and multi-lingual author of the Rolling Rains Report, concentrating on inclusive tourism, travel and universal design. Over dinner at Kincaid’s overlooking the San Francisco Bay, we tried to remember how we met and how long we had been corresponding – I’ve got email from Scott dated 2005, and I first linked to Gimp Eye for the Clueless Guy in 2003, so at least 7 internet years, which must be, what, 20 or 30 real years? 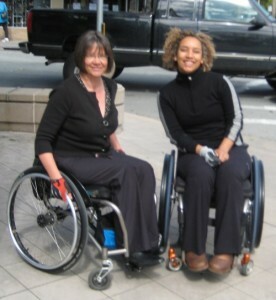 Wheelchair Dancer writes about dance, and life on both coasts, and especially about the body. Her writing is imbued with a physical sensuality that I’ve rarely seen in others, and in my efforts to become stronger and more connected with what my body can do I’ve gotten a lot of encouragement from her work. Check out WCD’s post on the Meeting – all true. When we crossed the road together, we both rolled down the driveway together, both stopped at the same time, bending over and looking to the left around the parked cars to check for traffic, both speeded up over the crest of the road…it was fun. I am glad you got to meet with some friends. You and WCD look great together, two strong women! If my sister drags me up to Colorado again this summer (she’s called to bribe me with staying in her house yesterday), I will let you know. I’d love to check out that accessible campground you visited. That’s a cool under-the-wheelchair pack, and WCD, are those burnt orange Y-forks on your casters? Very cool! As a huge fan of Katja, and a HUGE fan of meet and greets with the folks we never ‘met’. As a former dancer, but as yet to need my wheels, I find a grace in HOW I manage my dizzy wizzy stumbles and lurching movements. When I feel myself GO I automatically extend a leg to CATCH myself on a toe kick, or chair leg or whatever…. fridawrites, you are welcome anytime! You have a sharp eye – my under the chair bag is an Advantage Down Under bag, and WCD does have cool orange caster forks. .-= Latest from Katja: Meeting Old Friends =-. I met WCD in September in Mountain View and it was great. It’s so cool to meet people in person you know online for a long time. I am really looking forward to meet you somewhere down the road. .-= Latest from Christiane: Das iPhone und die Barrierefreiheit =-. Absolutely! I keep looking out for an opportunity to meet. i’ve been seeing old friends a lot lately – who have never seen me in my chair or on crutches, and who said it was a real eye opener. i also was very inspired by “wheelchair dancer’s” screen name – i was at a club recently and wanted to dance but didn’t know how to begin. her name inspires me to learn how. .-= Latest from stephen: potent quote =-.